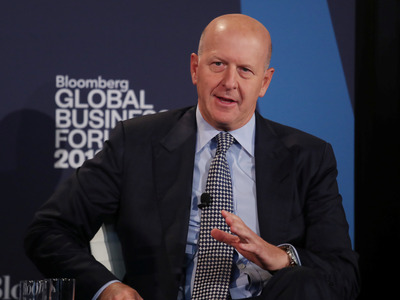 Getty ImagesGoldman Sachs CEO David Solomon. Goldman Sachs’ third-quarter earnings beat estimates on higher-than-expected revenue. Goldman Sachs announced third-quarter results Tuesday morning, posting earnings of $US6.28 a share. Analysts expected adjusted earnings of $US5.38 a share. Revenue: $US8.7 billion, up 4% from last year and beating expectations. Net income: $US2.5 billion, up 19% from last year and beating expectations. Return on equity: ROE rose to 13.7% year-to-date. Institutional client services: Revenue from sales and trading activities fell 1% to $US3.1 billion. Equities rose 8% to $US1.8 billion, while fixed income, currencies, and commodities revenue fell 10% to $US1.3 billion. Investment banking: Revenue rose 10% to $US2 billion, led by a surge in equity underwriting revenue. Investment management: Revenue rose 12% to $US1.7 billion. Investing and lending: Revenue fell 1% to $US1.9 billion.